KEULEN -La Baye d' Hollande ou de Maurits / Baye de Magdaleine. KEULEN, G. VAN. - La Baye d' Hollande ou de Maurits / Baye de Magdaleine. La Baye d' Hollande ou de Maurits / Baye de Magdaleine. - KEULEN, G. VAN. Title : La Baye d' Hollande ou de Maurits / Baye de Magdaleine..
Map maker : KEULEN, G. VAN.. Size : 11.0 x 9.1 inches. / 28.0 x 23.0 cm. Description :The successful van Keulen firm published charts, pilot guides and sea-atlases for over 2 centuries. 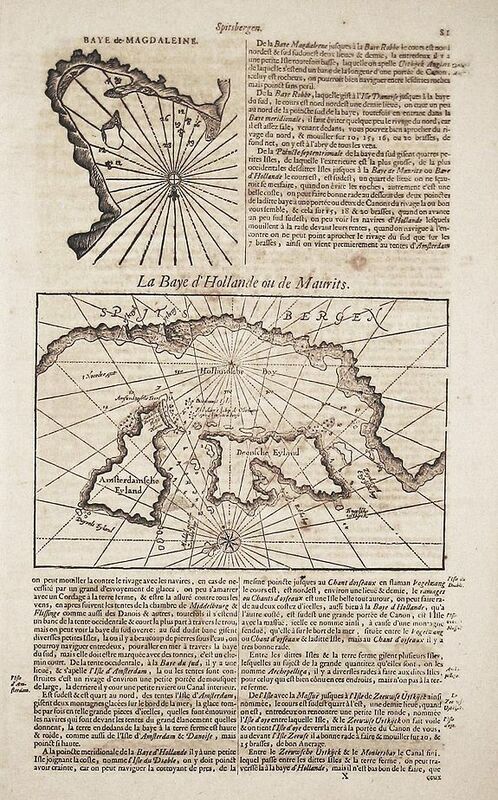 Founded by Johannes van Keulen, his son Gerard led the firm to its zenith in the period between 1700 and 1730.A detailed description of the coastal waters of Spitsbergen with two detail charts of Spitsbergen: a: Baye de Magdaleine, b: La Baye d'Hollande ou de Maurits, with the Hollandsche Bay and the Amsterdam and Denmark islands. And three coastal views. From the pilot-guide, the "Nouveau et et Grand Illuminant Flambeaeau de la Mer".